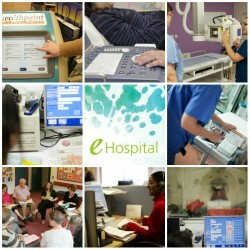 The Centre for Cambridge Clinical Informatics (CCI) was established in 2014 with the introduction of the Cambridge University Hospitals NHS Foundation Trust (CUH) electronic medical record (EMR) system known as eHospital, and significant funding from the Cambridge Biomedical Research Centre (BRC) under the newly established Informatics Theme. Transforming medicine through innovative use of electronic medical records, enabling translational research and bringing together clinicians, scientists, policy makers and the public requires physical and theoretical architecture in a range of disciplines including information and computing technologies, ethics, and information science, as well as collaborations from across the biological, social, medical and physical sciences. Healthcare is rapidly expanding and changing, with ever increasing new medications, procedures and methods of delivering care, and future visions of personalising medicine. Such innovation and development is essential in providing the best care possible for all members of society. However, if we are to realise the full potential of medical care that remains affordable to all, we need to develop methods to evaluate new and existing medications, procedures and pathways in practice, as well as develop ways to support the human element of healthcare delivery and the efficiency and capacity for the translation of future health research. Please click through to view our latest employment opportunities and studentships.